Ruger has always been associated with quality and the officially licensed Ruger® Range Bag is constructed with rugged Endura fabric and padded sides to help protect your firearm from scrapes & scratches. Includes a removable pistol rug as well and the 11.5″ x 7″ compartment features 6 magazine pockets, two 5″ x 5″ mesh pockets, and three rows of MOLLE loops. It is equipped with a removable ammo carrier. 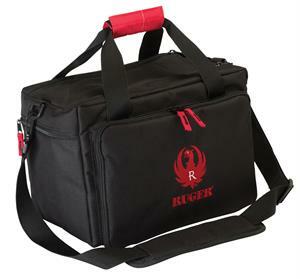 This Ruger Range Bag also comes with a detachable, padded shoulder strap.